1 D None No Power Seat 1 D is an Economy Plus seat, having a 4-8 inches higher pitch than the standard Economy Class seats. This seat may have limited legroom due to the positioning of the bulkhead. The tray table is in the armrest, making the armrest immovable and slightly reducing seat width. The proximity to the lavatory and galley may be bothersome. There is no floor storage during takeoff and landing. 1 F None No Power Seat 1 F is an Economy Plus seat, having a 4-8 inches higher pitch than the standard Economy Class seats. This seat may have limited legroom due to the positioning of the bulkhead. The tray table is in the armrest, making the armrest immovable and slightly reducing seat width. The proximity to the lavatory and galley may be bothersome. There is no floor storage during takeoff and landing. 10 A None No Power Seat 10 A is a standard Economy Class seat that has extra legroom due to the exit row ahead. There is no floor storage during takeoff and landing. 10 B None No Power Seat 10 B is a standard Economy Class seat that has extra legroom due to the exit row ahead. There is no floor storage during takeoff and landing. 10 C None No Power Seat 10 C is a standard Economy Class seat that has extra legroom due to the exit row ahead. There is no floor storage during takeoff and landing. 10 D None No Power Seat 10 D is a standard Economy Class seat that has extra legroom due to the exit row ahead. There is no floor storage during takeoff and landing. 10 E None No Power Seat 10 E is a standard Economy Class seat that has extra legroom due to the exit row ahead. There is no floor storage during takeoff and landing. 10 F None No Power Seat 10 F is a standard Economy Class seat that has extra legroom due to the exit row ahead. There is no floor storage during takeoff and landing. 2 A None No Power Seat 2 A is an Economy Plus seat, having a 4-8 inches higher pitch than the standard Economy Class seats. This seat may have limited legroom due to the positioning of the bulkhead. The tray table is in the armrest, making the armrest immovable and slightly reducing seat width. There is no floor storage during takeoff and landing. 2 C None No Power Seat 2 C is an Economy Plus seat, having a 4-8 inches higher pitch than the standard Economy Class seats. This seat may have limited legroom due to the positioning of the bulkhead. The tray table is in the armrest, making the armrest immovable and slightly reducing seat width. There is no floor storage during takeoff and landing. 2 D None No Power Seat 2 D is a standard Economy Plus seat. The Economy Plus seats have a 4-8 inches higher pitch than the standard Economy Class seats. 2 F None No Power Seat 2 F is a standard Economy Plus seat. The Economy Plus seats have a 4-8 inches higher pitch than the standard Economy Class seats. 20 A None No Power Seat 20 A is a standard Economy Class seat that is in the last row of the aircraft. The proximity to the lavatory and galley may be bothersome. 20 B None No Power Seat 20 B is a standard Economy Class seat that is in the last row of the aircraft. The proximity to the lavatory and galley may be bothersome. 20 C None No Power Seat 20 C is a standard Economy Class seat that is in the last row of the aircraft. The proximity to the lavatory and galley may be bothersome. 21 D None No Power Seat 21 D is a standard Economy Class seat that is in the last row of the aircraft. The proximity to the lavatory and galley may be bothersome. However, as the only twosome on the plane, this seat may be desirable if traveling with a partner. 21 E None No Power Seat 21 E is a standard Economy Class seat that is in the last row of the aircraft. The proximity to the lavatory and galley may be bothersome. 3 A None No Power Seat 3 A is a standard Economy Plus seat. The Economy Plus seats have a 4-8 inches higher pitch than the standard Economy Class seats. 3 C None No Power Seat 3 C is a standard Economy Plus seat. The Economy Plus seats have a 4-8 inches higher pitch than the standard Economy Class seats. 3 D None No Power Seat 3 D is a standard Economy Plus seat. The Economy Plus seats have a 4-8 inches higher pitch than the standard Economy Class seats. 3 F None No Power Seat 3 F is a standard Economy Plus seat. The Economy Plus seats have a 4-8 inches higher pitch than the standard Economy Class seats. 4 A None No Power Seat 4 A is a standard Economy Plus seat. The Economy Plus seats have a 4-8 inches higher pitch than the standard Economy Class seats. 4 C None No Power Seat 4 C is a standard Economy Plus seat. The Economy Plus seats have a 4-8 inches higher pitch than the standard Economy Class seats. 9 A None No Power Seat 9 A is a standard Economy Class seat that does not recline due to the exit row behind. 9 F None No Power Seat 9 F is a standard Economy Class seat that does not recline due to the exit row behind. Earbuds are available for purchase on all WestJet flights that offer in-flight entertainment options. Passengers can also use their own earbuds. All 3.5 mm (aproximately 1/8 in) stereo headphone connections (with one prong) will work with WestJet systems. For a description of the earbuds available for purchase, please visit the WestJet buy-on-board page. Aircraft equipped with new Slimline seats feature 110-volt AC power ports (compatible with North American, European, and British standards). WestJet is transitioning to a new wireless entertainment system which includes connection to the Internet. Various time-length passes are available. Fees range from $4.99 to $16.09. WestJet fleet of 737-600, 737-700, and 737-800 aircraft features leather seats and Personal TVs or Wireless Entertainment and Internet Connectivity. WestJet's B737-600 operates on short and medium-haul flights and has a 113 seats capacity. The Plus section is located in the first three rows of the aircraft and offer 3-4 inches of additional pitch. Passengers seated in Plus will get advance boarding, first access to overhead bins, and complimentary food and beverages (selections vary). In addition, the Plus fare offers passengers priority screening (at available airports) and the ability to change or cancel flights for no fee. Plus seats offer 4-5 inches of seat recline, Economy seats offer 3 inches of recline. All B and # seats will have a video entertainment or 110/USB power box underneath the seat in front limiting under seat storage space and legroom. It was bad, the whole plane was tiny, it didn't feel nice, I'm dreading flying on that plane again. I would recommend staying as close to the front exit of the plane as possible. Before leaving Puerto Vallarta, the plane had a delay of over 40 minutes, the crew didn't tell us anything, the front door of the plane was open, the outside temperature was extremely hot and there was no fresh air on the plane. I almost fainted because it was unbreathable. Eventually, the plane did take off and the air conditioning was turned ON. I have really disliked flying with Westjet for that reason. Really bad experience. Crew member weren't kind at all. Seat depth is not comfortable for a long flight. Im an average height woman (5 ft 5 in) and the seat came only about half way down my thigh. I feel sorry for taller passengers. the positioning of the seat to the window means your shoulder hits right where the body of the plane comes in. Might make it easier to lean against to sleep, but encroaches on you if you have wider shoulders. Not enough for an 'avoid' ratings since there is no one right next to you. I flew on this plane YOW-YVR in seat 9C. This 1/2 row of seats (9A-C) appears to have a tighter pitch than the other rows in economy. Great flight, super crew as always on WS. However, the window side armrest is effectively a "stub" -- it does not extend forward! Nothing to lean on -- Very strange. Apart from that, all was good! I made the mistake of not double checking which 737 model my flight would be on. I assumed I would be on a -700. It turned out to be a -600. Meaning the seat I chose (6A) which would be a great view was actually blocked due to lack of a window. Devastating for an airplane nerd. It was my mistake, however keep this info in mind for the future. The seat itself was okay, lots of shoulder room and friendly crew. Although Row 10 has lots of extra leg room (and another bonus: Row 10 passengers automatically get priority boarding, even ahead of elites), the window seats (10A and 10F) have no outside armrests, and they have very small bottom cushions that are significantly shorter and thinner than the other seats in the row. It feels like sitting on a low bench and is extremely uncomfortable, even on a 1-hour flight. Better to take 10C/D and get all the extra leg room and early boarding, with a normal seat cushion. Seat 14F has two windows instead of the normal one, making it one of the best seats for normal economy on the baby boeing. I flew WestJet Economy Plus from Vancouver to Ottawa as Air Canada wanted $ 3500 for a one way business class. The only thing that made the trip bearable was that I had the whole row to myself. I did not feel there was an extra 4-8 inches pitch, in fact it looked exactly the same as the rest of the cabin and a 17 inch seat is way too small for the average adult male had If there were two other persons in the row I would have been as squeezed as the rest of economy and would have paid an extra $ 200 for nothing. An empty seat in the row is not guaranted. Air Canada economy has a wider seat and a good video system. WestJet has the same boring tiny TV screen and a few must pay for movies I already saw. Not impressed. 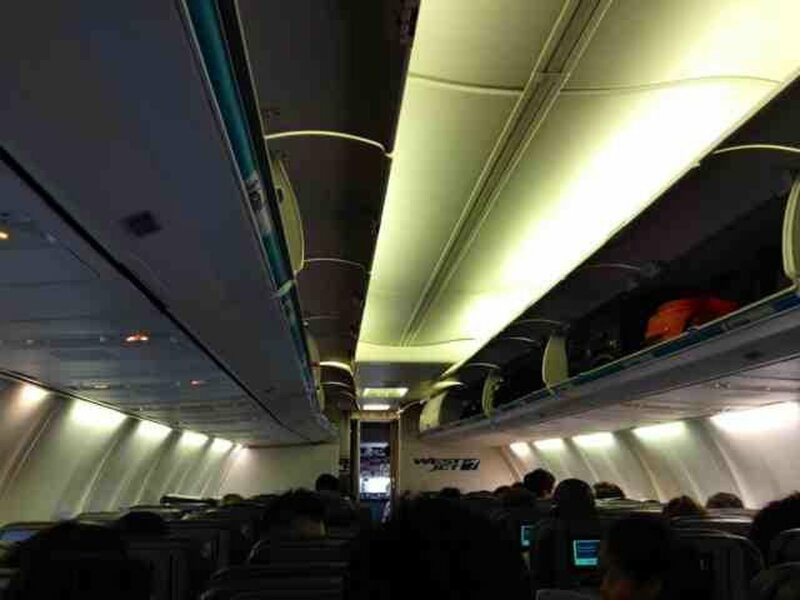 WestJet flies 1 versions of Boeing 737-600.